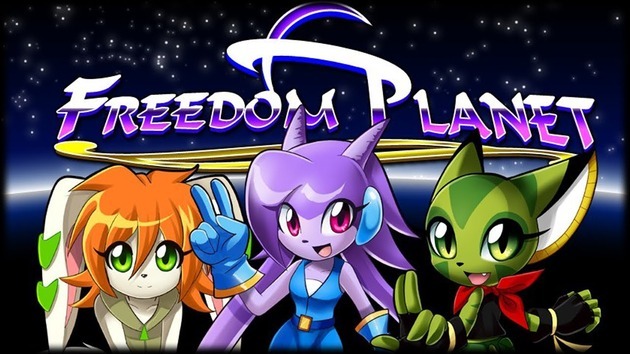 Few platformers have had super high speed platforming and ultra-tight gameplay outside of the Genesis Sonic The Hedgehog titles, but Freedom Planet possesses these attributes in spades and it all comes together perfectly in the game! The platforming in the demo stage was nearly flawless and had a well-balanced difficulty curve. The mid-stage boss was fairly easy, but that's to be expected from the first stage's mid-stage boss. Sadly the demo ended right before the main boss of stage 1 so we can't tell you anything about that fight, but we're sure that it will be as balanced as the rest of the stage was. We only had access to one character, but in the full-version which will release later this year there will be three playable characters! You can read more about the story, characters, and future DLC in our Developer's Interview with Galaxy Trail Games! The game feels like it melds gameplay aspects from Sonic as well as some of the noteworthy beat 'em ups from the Genesis era. It all blends together beautifully! The graphics are vibrant and really make you feel like you're playing a 16-bit Genesis title. The soundtrack is also equally nostalgic and is easily as good as Shovel Knight's based on the few tracks in the demo. The voice acting on the other hand, while surprisingly good, just feels out of place in the title, but otherwise what little of the game that we could play is as close to perfection as a game can get and we highly recommend keeping an eye on this title! This game sounds like it is going to be good! The game is so much like the old Sonic games and the Megadrive graphics engine looks so beautiful!